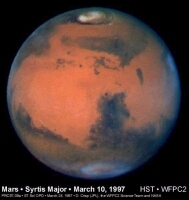 Sharp image of Mars taken with the Hubble Space Telescope showing the dark and light regions. The Romans named the planet Mars after their god of war because its colour reminded them of the blood shed on the battlefield. Mars, like blood, derives its red colour from oxidised iron. Haemoglobin carries oxygen bound to iron in the blood, whereas dust, soil and rock rich in oxidised iron give Mars its reddish hue. If you look at Mars through an Earth-bound telescope - or take a glance at some Hubble Space Telescope pictures of the planet - you'll notice that some areas are brighter than others. By looking at the wavelength of sunlight absorbed and re-emitted by different areas, astronomers have known for some time that the difference in brightness coincides with differences in the way in which iron is bound up in the surface materials. Bright areas are rich in heavily oxidised iron minerals and dark areas contain unoxidised iron bearing minerals. 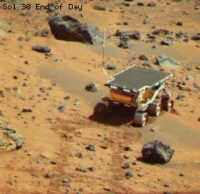 Sojourner rover on Mars. Sojourner carried a European-built instrument for analysing soil and rock samples. Appearances, however, can be deceptive - and Mars is no exception. The nature of the surface seen from a distance reveals little about the composition of the underlying rock because the planet is covered with dust, the product of billions of years of erosion by the Martian wind. In some places, rock is exposed, but in others wind-blown dust has masked underlying features. Near the north pole, for example, the dust has been blown into dunes. Our knowledge of the composition of the underlying Martian surface took a leap forward in 1997 when NASA's Pathfinder spacecraft landed in the Xanthe Terra region of the northern hemisphere. On board Sojourner, Pathfinder's small rover, was the first instrument to land on Mars capable of analysing soil and rocks in situ. 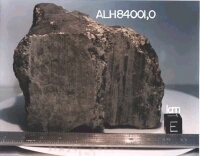 ALH84001, the famous martian meteorite that is made from 'mafic' type rock. "Before the Pathfinder mission there was a general consensus that the Martian surface is very mafic (made from volcanic lava) like the Martian meteorites. But the first measurements by Pathfinder showed that the rocks are felsic (containing the whitish mineral feldspar), rather like the Earth's continental crust," says Heinrich Wänke, from the Max Planck Insitut für Chemie, Mainz, the institute where the APX-spectrometer on board Sojourner was designed and built. Mafic rocks are high in magnesium and iron and are thought to derive from pristine mantle material; felsic rocks are rich in silicates, potassium and sulphur but low in magnesium and are thought to derive from rock that has undergone subsequent processing since the planet's formation. Taking into account evidence from the Martian meteorites, Pathfinder and observations from orbiting spacecraft, planetary scientists have deduced that the low lying plains in the northern hemisphere are felsic and the ancient highlands in the southern hemisphere are mainly mafic in composition. This division corresponds well with a relatively recent volcanic origin for the northern lowlands and the existence of an ancient, primordial crust in the south. Recent spectral analyses of light reflected from Martian soil and dust reveals that it is made from a mixture of small grains of the two types of rock roughly in proportion to their prevalence in the underlying surface. Dust covers everything. 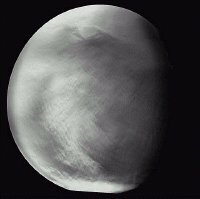 Mars Global Surveyor image of a global dust storm in 1997 (NASA/JPL/Malin Space Science Systems). Space missions so far have given us the general picture. The next step is to map the surface composition of Mars with far greater accuracy. "We want to know the iron content of the surface, the oxidation level of the iron, the hydration of the rocks and clay minerals, the types of silicates present and the abundance of non-silicate materials such as carbonates and nitrates," says Jean-Pierre Bibring from the Institut d'Astrophysique Spatiale, Orsay, France, who is Principal Investigator for the Infrared Mapping Spectrometer (OMEGA), which flies on board Mars Express. OMEGA with the help of two other Mars Express instruments, the HRSC and MARSIS, will map the composition of the Martian surface to this level of detail.